Last Wednesday I finally returned from my 10-day Swiss junket that included a three-day stop in Davos with Movado (that’s an upcoming story in itself) followed by six days in Baselworld. Here, I bring you an insider’s view of what Baselworld really went through this year — the good, the bad and the ugly. And, believe me, as I have attended Baselworld for 35 years now, I think I’m a good judge. There is no denying that traffic was down significantly, as were exhibitors. In fact, across the board there was about a 22 percent decline in visitors (81,200 attended this year) and brand exhibitors (520 showed this year). About 10-12 percent fewer journalists attended, as well. But still, 3,300 bloggers and journalists made the trek this year. 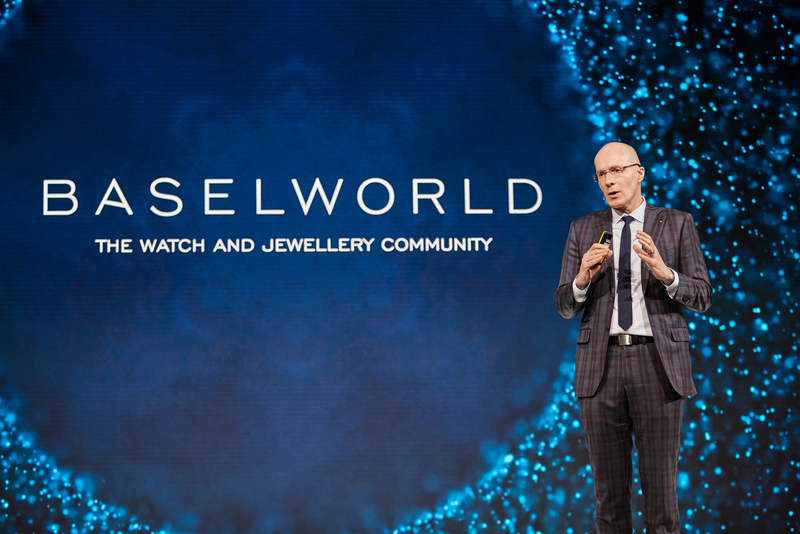 Despite the numbers, there was a quiet excitement in the air — for a host of reasons — not the least of which was curiosity… What will happen to Baselworld? 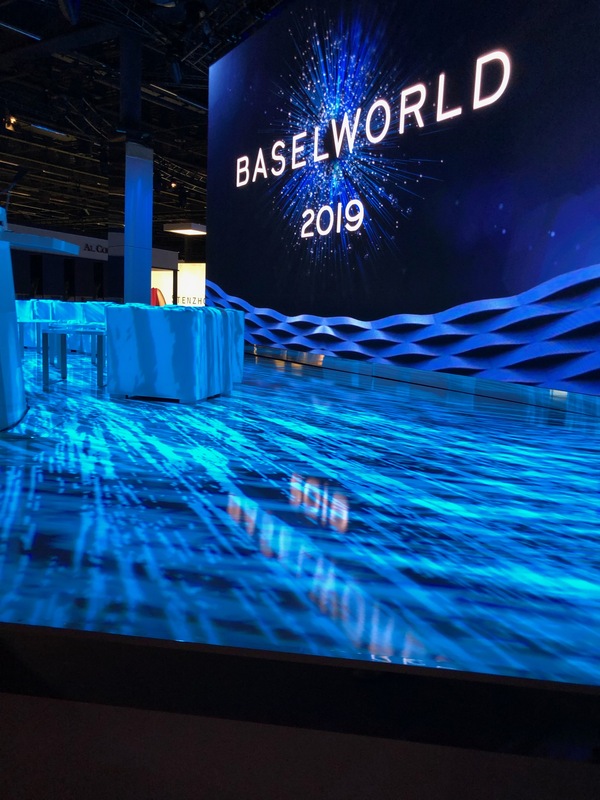 Inside Hall 1.0 at Baselworld 2019 just hours before the show officially opened. This year, I was asked by the Fair organizers, MCH Swiss Exhibition Ltd., to be a Baselworld Brand Ambassador. I wasn’t sure exactly what that meant — other than the fact that I, along with about 30 of my global colleagues — had been elevated to VIP Press status. We were treated to an insider’s first-look at the halls — three hours before others were allowed in. We were taken on a tour by the new Managing Director of MCH, Michel Loris-Melikoff, whose honesty was refreshing. As we walked all three levels of Hall 1, he didn’t sugar-coat the fact that the fair had lost exhibitors. He wasn’t arrogant, but rather apologetic for the actions of previous management and hopeful that those who attend this year’s transitional fair would be positive and supportive of the changes. 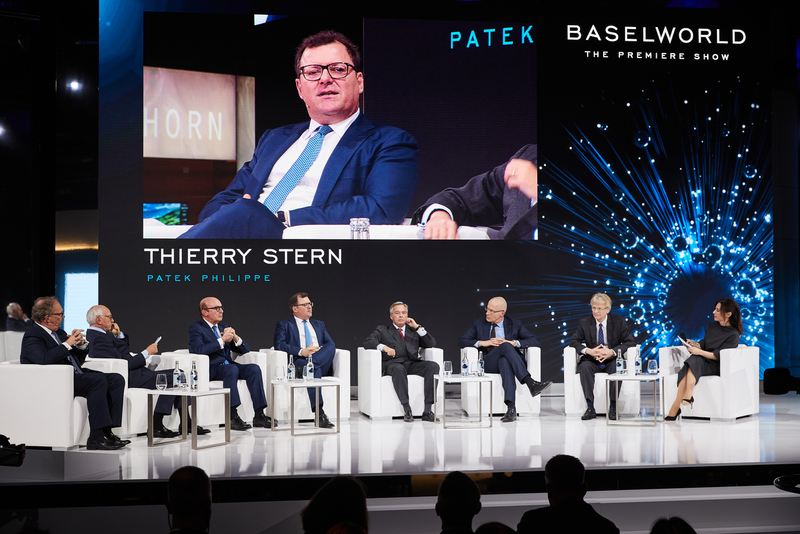 He laid out his vision for the 2020 Baselworld fair and — in general — left everyone with a pretty good attitude about the new direction. However, as a journalist, I wasn’t allowing the wool to be pulled over my eyes that easily. I decided i would reserve my judgement until the end of the show. With the entire Swatch Group gone from the middle of Hall 1- but having already paid their fees for the space — the fair was unable to put any other brands in the Swatch Group area. There was a lot of speculation that the Fair was leaving the space open in case Swatch Group wanted to come back — an option Nick Hayek Jr. squelched just days before the Fair opened when he announced Swatch Group would not be returning. Swatch Group was already in the throes of executing its first-ever summit (much the same as Movado had done the year before after pulling out of Baselworld in 2017). 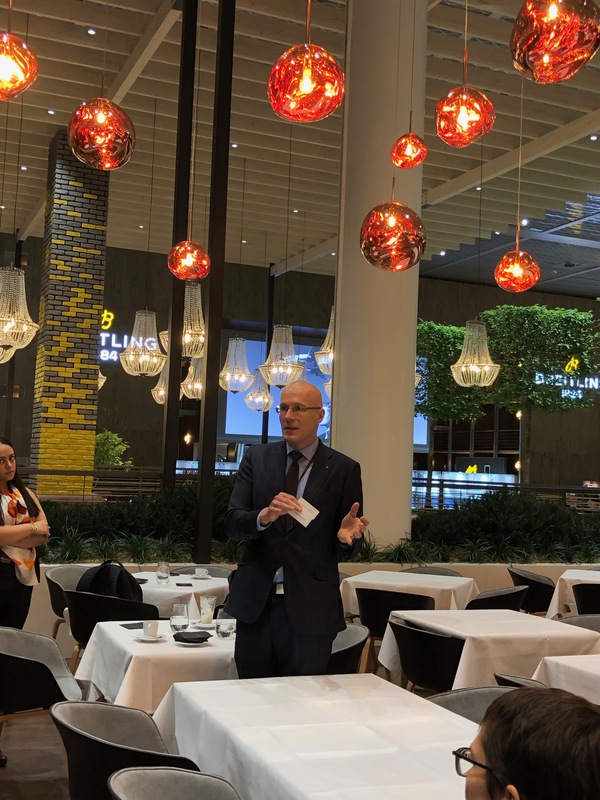 In fact, retailers carrying the top-tier Swatch Group brands (Blancpain, Breguet, Jaquet Droz, Glashutte Original, Harry Winston and Omega) were treated to a full day of new product presentations in Zurich (an hour away by train) during Baselworld, and select press will be seeing all of the new product in mid-May in a similar summit in Geneva. In terms of layout in Hall 1: the previously Swatch Group-occupied space this year became a large open hallway with a rippling water element, flowering trees and bushes and seating all around. On one side, there was a restaurant with ample seating (that was crowded every day at lunch time), and a Grab-and-Go sandwich and salad stop (with high prices). There was also a Breitling restaurant reserved for the brand’s top guests. On the opposite side of the hallway was the Press Room, which I referred to as the fish bowl. On more than one occasion, when I was there, I heard my name being called out by retailers or exhibitors passing by and wanting to say hi. I liked the convenience of the press room there, but not the fish-bowl setting. Next year, we already know that the press room will be moved yet again. Something we journalists have gotten used to. There were also rumblings that Rolex was reconsidering its return. Rumors that LVMH Group might be leaving. The same with Chanel. Thus far, none of these withdrawals have been confirmed. However, it is interesting to note that next year, with how late the two shows will be running (April/May), certain brands will need to show product earlier and may opt for their own traveling summits. Additionally, it no longer makes sense for the LVMH Group, and a few others, who currently show in the city of Geneva during SIHH in January and then again in Baselworld, to show in both places. The question becomes, “Which city will they choose to exhibit their wares in?”. 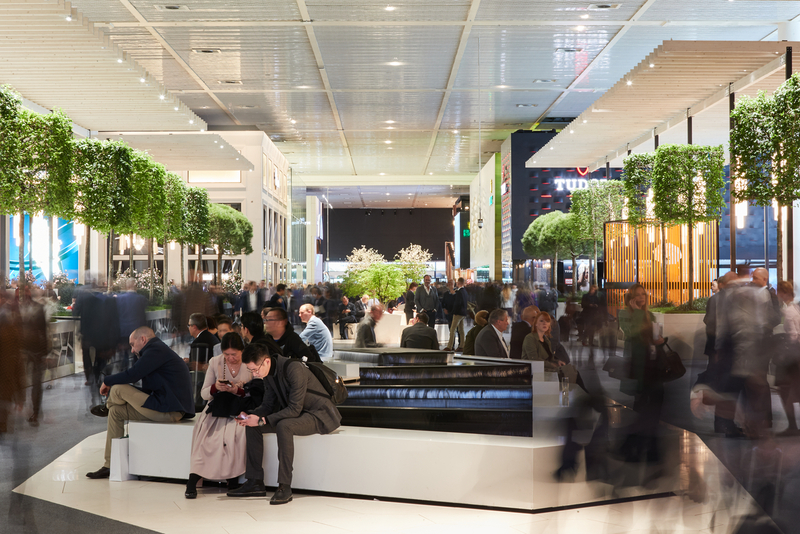 Back to the Baselworld Halls, Hall 1.1 remained pretty similar to what it had been, with Roberto Coin now taking the space previously occupied by DeGrisogono, and a few other changes. (The space that had been Swarovski was now a food court with seating.) However, upstairs in Hall 1.2, where some watch brands still exhibit alongside a host of jewelry brands, there was a great open space with a stage for press conferences and for fashion runway shows. In my opinion this should have been situated in hall 1.1 instead — maybe where Swarovski had been — to make it more visible to passers by. Still, nearly a dozen brands booked the space for fashion shows and the Fair held its opening and closing press conferences there. Like the press, the independents — occupying a space called Les Ateliers — were moved yet again. With the “palace” gone a few years ago, they had been moved upstairs in Hall 1 for the past two years. This year, they were moved across the street into Hall 1 South — opposite the main entrance to Hall 1 North. They occupied the space previously used by the entire Movado Group. Their space was ample and easy to work. It still had a little bar/food counter and generally was busy. I thought, however, that the area needed a lot more signage outside, pointing visitors to the Les Ateliers exhibitors. Upstairs in that building — where the press room had been last year — was a new exhibition space called “Incubator.” For me, this was particularly enjoyable and I wished I had visited sooner than the last afternoon, because I would have enjoyed spending more time there. Essentially, counter-after-counter was set up with individual smaller brands showcasing their products. Singer Reimagined was there (sorry, by the way, but every time I came by you were busy), Ikepod, Riskers (this is an interesting story that will be forthcoming), a great brand called Karsten FraBdorf (another upcoming story), my old and dear friend Gilles Robert of Robert & Fils with a great black leather woven strap and diamond line called La Dentelle, and more. It was sort of a fun, easy space where you could find a few young, new brands. There were still the hangers-on who exhibited over at the Hyperion hotel, and a few at the Hotel Le Plaza (Swissotel). Additionally, as they did last year, Mondaine and Luminox, as well as Reuge Music, took store-front space on Claraplatz, just a block away from the Fair. 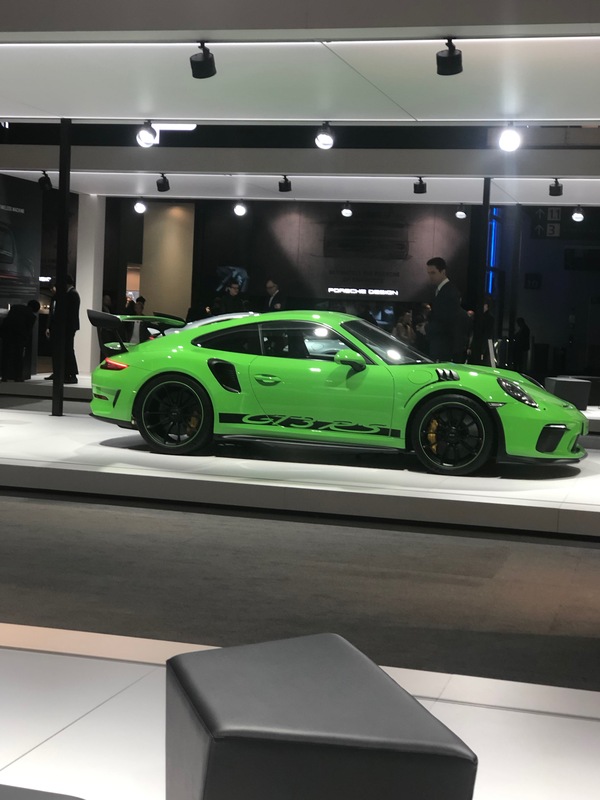 Somehow, I can’t help but feel that if Baselworld management had found a way to bring all of these outside exhibitors back into the Fair, perhaps instead of the Porsche Design cars and the champagne bar, it would have been a stronger show. The cars and the champagne could have remained outside to brighten the space and once again act as a gathering spot. Of course, according to Loris-Melikoff, maybe a few of these brands will come in next year, when, he says, costs to exhibit should be down by 15 percent or more. Again, however, the timing of the show next year makes it difficult for many brands because it is so late in the year. Retailers need to plan ahead especially for the holidays and that means seeing product earlier and making decisions earlier. As such, many brands will be implementing retail and press tours to show their products, and with that expense globally, the question is do they need to exhibit. The flip side is that next year, Baselworld promises to have many new spaces and types of exhibits in play (including a Blue Room for presentations that may answer Breitling’s call) — making the show much more visitor-friendly, exhibitor-friendly and relevant in today’s instantaneous social media world. The good: There was plenty of time to see more brands and executives, and to do more networking than in the past.There was still an enthusiasm in the air. Certain watches. The bad: The undeniable loss of traffic and exhibitors. Certain watches. The Ugly: The outside of the fair just wasn’t the same. Sure there was the sausage stand and the little restaurants at the corners of the Fair buildings, but without the beer and champagne stands, without the music at the day’s end, it seemed a bit flat and boring. Certain watches. As to the “Certain watches” part of the good, bad and the ugly … stay tuned. That’s another story. My judgement: I’ve attended Baselworld for nearly 35 years now. I’ve watched the show morph, grow, shrink, grow again, and so on. I don’t believe this is the end of an era that has spanned more than a century. I believe that the show will continue to transition into something everyone wants to attend. Let’s face it, new shows are popping up all over the world. In America alone, in addition to the steadfast trade shows of JCK, Couture, JA, we now have more consumer- and collector-focused watch shows such as Watches & Wonders Miami, WatchTime Los Angeles in addition to WatchTime New York, Worn & Wound’s Wind Up show and more. They key is relevancy. Can Baselworld make itself more relevant for 2020? I say yes. Baselworld Fair is not going anywhere. My schedule of the past remained intact for Baselworld 2019, despite the fewer number of exhibitors (let’s face it, no one can see 500 exhibitors in six days anyway). 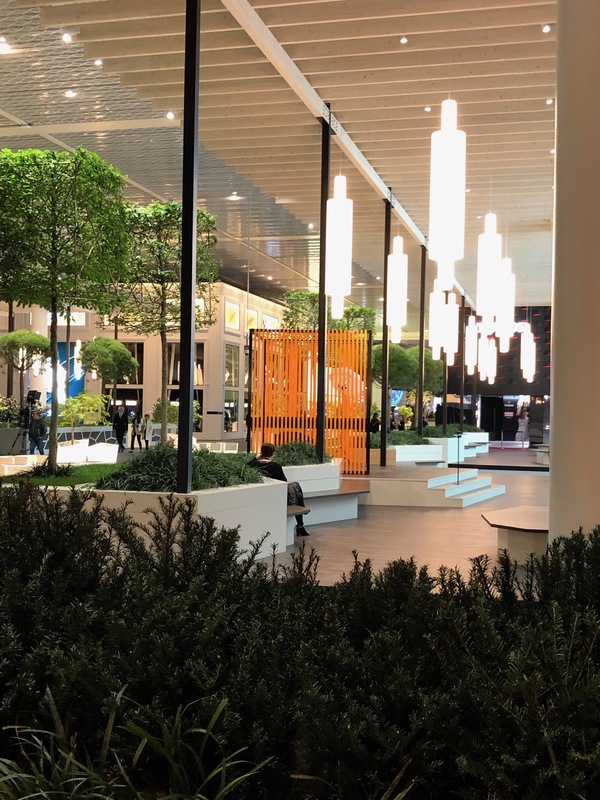 As I wrote last year in a column for another publication,”Despite (or maybe because of) all of the hoopla and hurrah that defines Baselworld, the fair can be an exhausting experience for journalists like myself who work tirelessly to find all the right products and stories to report back on. Having attended the show for decades, I hold myself to a higher standard. I set goals to always meet at least two to three new brands, and to seek out the most intriguing and interesting interviews to bring to the forefront. Like retailers, bloggers and other journalists, my schedule is rather grueling, with more than a dozen appointments packed into each day, as well as scheduled cocktails, dinners and even breakfast meetings (there is never any time for lunch). The standard wake-up alarm is 6:30 am, and most nights don’t really end until the wee hours of the next morning. The schedule continues for six straight days: breakneck speeds and exhilarating experiences that I wouldn’t trade for anything. True, this year’s product may have left a lot (or a little) to be desired, but the same was true earlier in the year at SIHH and around Geneva during what has become known as Geneva Watch Week. More brands are playing it safe, unveiling entry level products to attract new customers and trying to figure out their next steps in an industry rife with gray market problems, over production and a struggling brick-and-mortar retail environment. Some brands, however, are remaking true to their philosophies and striving to go above and beyond with watch technology, materials, aesthetics and more. Bravo to them. 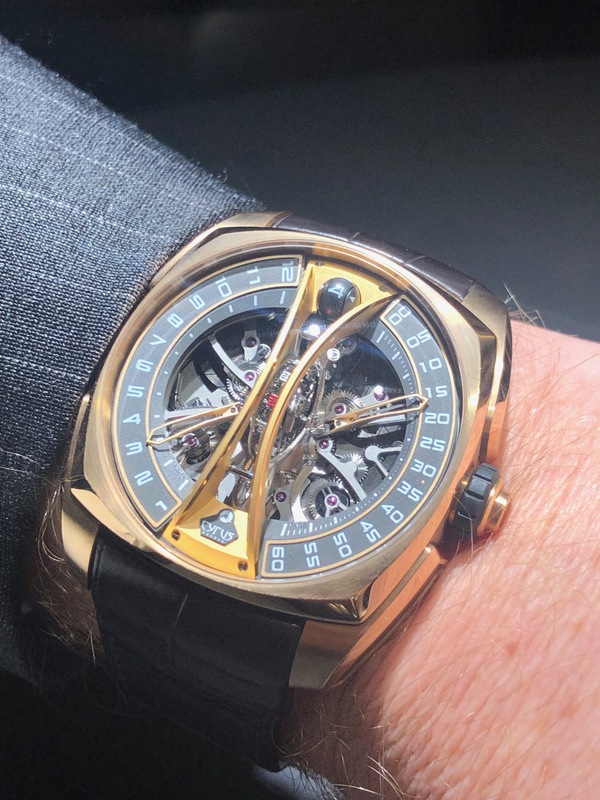 Again, as I said above, this year’s Baselworld products ran the gamut and could be included in each of the categories: the good, the bad and the ugly. But that’s another upcoming story.